The Mercedes-Benz Stadium in Atlanta, Georgia was announced as the host site for the fourth College Football National Championship on November 4, 2015. The College Football Playoff (CFP) selection committee selected four teams to advance to the playoff: the Clemson Tigers, Oklahoma Sooners, Georgia Bulldogs, and Alabama Crimson Tide. The Alabama Crimson Tide defeated the Clemson Tigers in the 2018 Sugar Bowl by a score of 24–6 to reach the championship game. The Tide had a 12–1 season, becoming the SEC West Division co-champions with the Auburn Tigers. 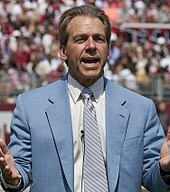 The Crimson Tide were coached by Nick Saban. The Georgia Bulldogs defeated the Oklahoma Sooners in the 2018 Rose Bowl by a score of 54–48 in double overtime to reach the championship game. The Bulldogs had a 13–1 season claiming their 13th Southeastern Conference (SEC) championship with a win over Auburn Tigers, 28–7. The Bulldogs were coached by Kirby Smart. After winning the coin toss, Alabama deferred to the second half and Georgia received the ball to begin the game. After two plays, quarterback Jake Fromm attempted a pass downfield and was intercepted by Tony Brown. Alabama began their first drive of the game, and, after eleven plays, that drive ended with kicker Andy Pappanastos missing a 40-yard field goal. The teams each had three-and-outs for the game's first two punts. During Georgia's ensuing drive, the quarter ended, with no score. After a failed third down conversion, on the second play of the second quarter, Georgia kicker Rodrigo Blankenship hit a 41-yard field goal to open the scoring and put Georgia in the lead by three. Alabama's ensuing drive went nowhere, as they gained four yards on three plays and punted. Georgia took the ball and drove down the field, and found themselves with a first and goal at the Alabama 10-yard-line; the Tide defense held, however, and the Bulldogs settled for a second field goal and took a 6–0 lead with just over seven and a half minutes until half. On Alabama's next drive, the Georgia defense held yet again and Alabama's JK Scott punted for the third time. Just prior to the punt, Georgia wide receiver Javon Wims was shown walking to the locker room, reportedly with a left shoulder injury. Both defenses then forced punts, and Georgia took back over with 1:19 remaining in the half on their own 31-yard-line. Nine plays later, on Alabama's 1-yard-line, Mecole Hardman took a direct snap, faked a handoff, and ran into the end zone for the game's first touchdown, putting Georgia up 13–0 going into halftime. Because they deferred the coin toss, Alabama received the ball first in the second half. They started their drive on their own 22-yard-line. Tua Tagovailoa, Alabama's backup quarterback, started the second half for the Tide; that drive quickly resulted in a three-and-out. The initial punt was blocked, but an erroneous offside call gave the Tide another chance to punt. Georgia started their drive on their own 36-yard-line, but punted on 4th & 17. Alabama took over on their own 44-yard-line. The teams then traded touchdowns on consecutive drives; Alabama scored their first points of the game on a 6-yard pass from Tagovailoa to Ruggs, but Georgia immediately responded with an 80-yard touchdown connection from Fromm to Mecole Hardman, putting Georgia up 20–7. On the second play of Alabama's ensuing drive, Tagovailoa, while scrambling to the left, threw into traffic and was intercepted by Georgia's Deandre Baker. Up 13, the Bulldogs took over possession of the ball on Alabama's 39-yard-line. The Tide defense responded immediately, however, as Raekwon Davis intercepted a Jake Fromm pass on the first play of Georgia's drive, returning the pick to the UGA 40-yard-line. The Tide gained fifteen yards on six plays and kicker Andy Pappanastos avenged his earlier miss with a 43-yard field goal that put Bama within ten. The teams then traded punts. Just prior to Alabama's punt, it was announced that an Alabama defensive back, Kyriq McDonald, had collapsed on the sideline; the situation was described as a "serious medical emergency". He was loaded onto a medical stretcher awake and conscious. Georgia could not muster anything on offense that drive, and punted. The fourth quarter saw Tagovailoa lead the Tide to come back and tie the game at 20 with 3:49. With three seconds remaining in the game, Andy Pappanastos missed a potential game-winning 36-yard field goal to the left, sending the game to overtime. In overtime, Georgia had an unsuccessful drive that resulted in both a three-and-out, and a 13-yard loss sack to Fromm. Georgia opted to attempt a 51-yard field goal, which they successfully made. On Alabama's first offensive play in overtime, Tagovailoa was sacked for a 16-yard loss, but immediately followed that with a game-winning 41-yard touchdown pass to DeVonta Smith, in a play that has since been called "2nd and 26" by fans. Tagovailoa was named the offensive player of the game, and Daron Payne was named the defensive player of the game. The game was televised nationally by ESPN. On January 8, 2018, the network announced that its broadcast would feature a live performance by Kendrick Lamar during halftime. This performance was separate from the event proper at Mercedes-Benz Stadium (which featured a traditional halftime show with the marching bands of the participating teams), and originated from Centennial Olympic Park. Following an undefeated season in the American Athletic Conference and their victory over the Auburn Tigers in the 2018 Peach Bowl, the UCF Knights claimed the national championship by virtue of being the only undefeated team in the FBS level of college football. UCF held a victory parade at Disney World and hung a national championship banner at their stadium to celebrate this achievement. The school also paid national championship bonuses to all of its assistant coaches, many of whom left UCF after the Peach Bowl to follow head coach Scott Frost to his new head coaching job at Nebraska; Frost himself (who coached UCF in the game) did not receive such a bonus because he had already been paid all of the bonuses allowed by his UCF contract. The selection committee controversially ranked undefeated UCF 12th at the end of the regular season, below a number of two-loss teams from the Power Five conferences, which left them out of the CFP. The AP Poll ranked Alabama No. 1 in its final poll, receiving 57 first-place votes, while UCF was ranked No. 6 and received four first-place votes — the first time in the CFP era that the AP poll did not have a unanimous No. 1 team. Additionally, the Knights finished the 2017 football season as the No. 1 team in the Colley Bias Free Matrix Rankings. The Colley Matrix was used in the past as one input to the BCS computer rankings and is included in a list of historical "national champion major selections". ^ Kirshner, Alex (January 8, 2018). "A Big Ten officiating crew is working the all-SEC National Championship". SBNation.com. SB Nation. Retrieved January 8, 2018. ^ Volner, Derek (January 9, 2018). "Epic College Football Playoff National Championship Delivers Massive 16.7 Overnight, Up 9% Year-Over-Year". www.espnmediazone.com. ESPN MediaZone. Retrieved December 4, 2018. ^ Alex Scarbrough (November 4, 2015). "Atlanta, Santa Clara and New Orleans land CFP title games for 2018–20". ESPN.com. Retrieved November 4, 2015. ^ a b "Selection Committee Rankings: Final Top 25 Rankings" (PDF). College Football Playoff. December 3, 2017. Retrieved December 3, 2017. ^ "Alabama's Sugar Bowl win against Clemson sets up all-SEC final: Final score, stats, analysis". nola.com. January 1, 2018. Retrieved January 2, 2018. ^ Emerson, Seth (January 1, 2018). "Georgia to play for national championship after Rose Bowl win in 2 OT". ajc.com. Retrieved January 2, 2018. ^ "CFP National Championship Game Book" (PDF). January 8, 2018. p. 5. Retrieved January 20, 2019 – via rolltide.com. ^ a b c d e Hoffman, Benjamin; Drape, Joe; Tracy, Marc (January 8, 2018). "National Championship Game: Georgia vs. Alabama Live Score". The New York Times. Retrieved January 8, 2018. ^ Perez, A.J. (January 9, 2018). "CFP players of the game: Alabama's Tua Tagovailoa and Daron Payne". USA Today. Retrieved January 9, 2018. ^ "Kendrick Lamar to Perform at College Football Playoff Title Game". Billboard. Retrieved December 20, 2017. ^ Baker, Matt (January 3, 2018). "UCF is really claiming a national championship". tampabay.com. Retrieved January 7, 2018. ^ Rollins, Khadrice (January 2, 2018). "UCF Is Having a Parade at Disney World for National Championship Caliber Season". Sports Illustrated. Retrieved January 10, 2018. ^ Gartland, Dan (January 3, 2018). "UCF Is Hanging a National Championship Banner at Its Stadium". Sports Illustrated. Retrieved January 10, 2018. ^ Chavez, Chris (January 3, 2018). "UCF AD Says Coaches Will Be Paid National Championship Bonuses". SI.com. Retrieved January 11, 2018. ^ "Alabama is No. 1 in final AP poll for 11th time; UCF 6th". Msn.com. January 9, 2018. Retrieved January 16, 2018. ^ Roger Simmons (January 9, 2018). "National champions: UCF Knights finish season ranked No. 1 in Colley Matrix". orlandosentinel.com. Retrieved February 14, 2018.